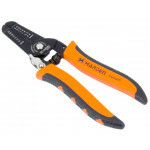 Harden crimping tool with wire stripper is manufactured from a heavy gauge carbon steel for long life and durability. 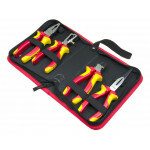 Can be used for insulated and non insulated crimp terminals. 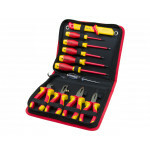 All in one tool is very convenient for electrician and automotive repair. Pliers designed with a self opening spring loaded mechanism and safety locking tab for secure storage and one hand operation. This wire crimper also features a wire cutter and wire shielding stripper. PVC insulated thick hand grips provide comfortable and secure grip. This tool cuts and strips stranded wire from 10-22 AWG. Use the built-in plier jaws at the end to be.. This professional wire stripper is an easy to use tool that strips solid and stranded electrical wir..